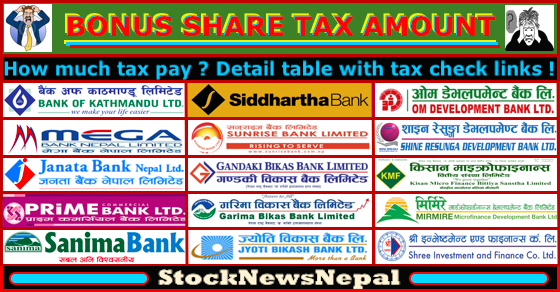 This is an interactive blog page on the information on Nepal Stock Exchange (NEPSE) online news. This site will also contain relevant videos, interviews, movies and slides on lessons for learning for stock investment in Nepal. CHECK Himalaya Urja IPO Allotment Result BELOW ! हिमालय उर्जा आईपिओ बाँडफाँड नतिजा थाहा पाउन तल क्लिक हेर्नुस् ! 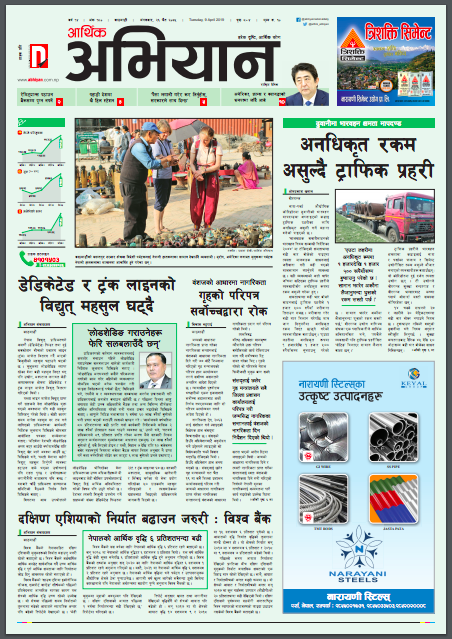 CHECK Trishuli IPO Allotment Result ABOVE ! त्रिशूली आईपिओ बाँडफाँड नतिजा थाहा पाउन माथि क्लिक हेर्नुस् ! CHECK Sparsha Laghubitta IPO Allotment Result ABOVE ! स्पर्श लघुवित्त आईपिओ बाँडफाँड नतिजा थाहा पाउन माथि क्लिक हेर्नुस् ! CHECK YOUR BONUS SHARE TAX 2073/4 DETAILS HERE ! आ.व. २०७३/४ बोनस सेयर करको विष्तृत विवरण यहाँ हेर्नुहोस् ! CHECK Current Bonus Share & Cash Dividend HERE ! बोनस सेयर तथा नगद लाभांश हेर्न यहाँ क्लिक हेर्नुस् ! 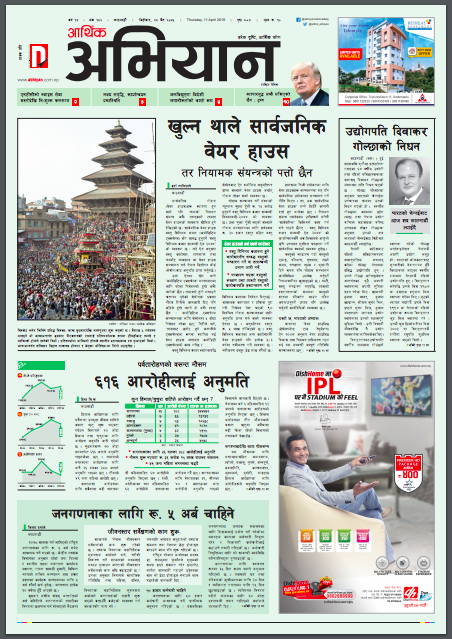 CHECK NEPAL BANK COMPANY ANALYSIS HERE ! हालै एफपीओ जारी रहेको नेपाल बैंकको वित्तीय अवस्था कम्पनी विश्लेषण यहाँ हेर्नुस् ! 6. Not Allotted means you are not allotted any share ! Himalaya Urja IPO Allotment Result - 66,950 Lucky Applicants Allotted Maximum 20 Unit Shares Each ! 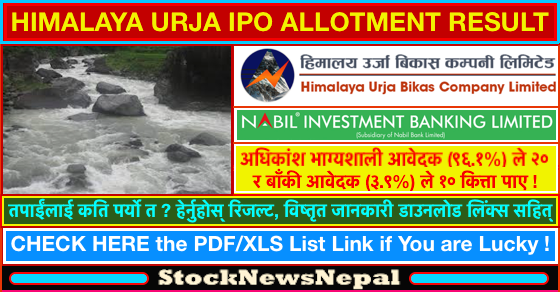 Himalaya Urja Bikas Company Ltd. (HUBCL) has successfully concluded its initial public offering (IPO) on Tuesday afternoon at 1:00 PM today, 16th April 2019 (3rd Baishakh 2076) in Indreni Banquet, New Baneshwor, Kathmandu. 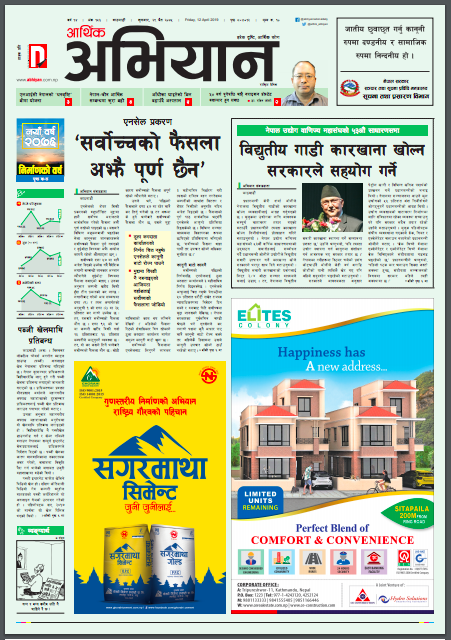 The company had floated 1,485,000 unit shares worth Rs 148.5 million (Rs 14.85 lakhs) at a face value of Rs 100 each to the general public, for four working days, starting from Wednesday 3rd April 2019 (20th Chaitra 2075) to Monday 8th April 2019 (25th April 2075) just over a week ago. According to Nabil Investment Banking Ltd., its issue manager, the issue had received 69,708 applications for 4,895,850 total unit shares with 3.58 times oversubscription, of which 38 applications for 2,800 unit shares were deemed invalid due to errors and of the remaining 69,670 valid applications for 48,93,050 unit shares, all were allotted 10 mandatory unit shares each initially and the remaining unit shares were then allotted again to 66,950 lucky applicants through lottery system an additional 10 unit shares each, on pro rata basis so that 66,950 (96.1%) of the valid applicants have been lucky enough to be allotted with a maximum of 20 unit shares and 2,720 (3.9%) with a minimum of 10 only, thus leaving none empty handed. 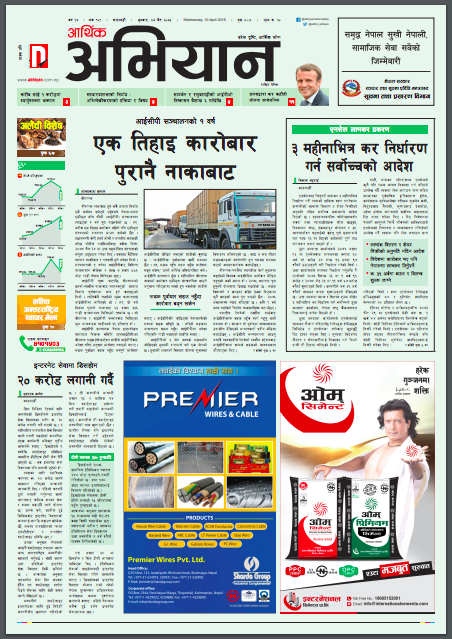 Arthik Abiyan: Read/View Today's Issue Here ! 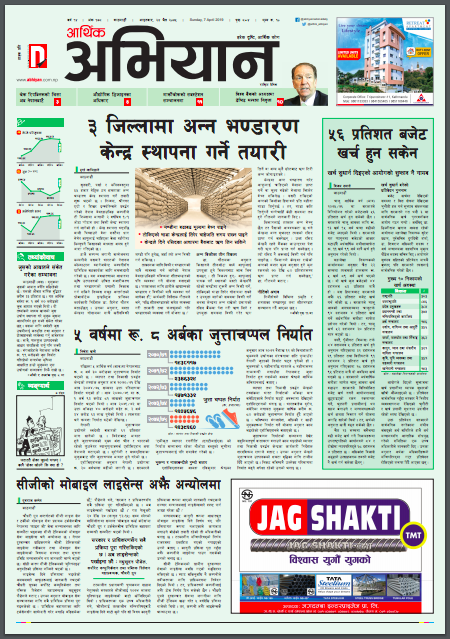 'Aarthik Abhiyan National Daily' is a national daily newspaper on economy-politics including share market and activities on stock and banking. Trishuli IPO Allotment Result - 50,267 Lucky Applicants Allotted Maximum 30 Unit Shares Each ! Trishuli Jal Vidhyut Company Ltd. (TJVCL) has successfully concluded its initial public offering (IPO) on Thursday morning at 1:00 PM today, 28th March 2019 (14th Chaitra 2075) in the presence of honorable minister Mr. Barsha Man Pun in the meeting hall of his Ministry of Energy, Water Resources and Immigration, Singha Durbar, Kathmandu. The company had floated 3,705,000 unit ordinary shares worth Rs 370.5 million (Rs 37.05 crores) at a face value of Rs 100 each with an initial call amount Rs. 10 to the general public, for four working days, starting from Thursday 21st March 2019 (7th Chaitra 2075) till its early closing date Monday 25th March 2019 (11th Chaitra 2075) just this week. As per its issue manager Global IME Capital Ltd., the issue had received 154,624 applications for 64,552,900 unit shares worth Rs 645.529 million (Rs 64.55 crores) with 18.61 times oversubscription, of which 67 applications were invalid due to errors and of the remaining 154,559 valid applications, all were allotted a minimum 20 unit shares each while only 50,267 lucky ones were allotted an additional 10 unit shares each by lottery on pro rata basis, thus 50,267 applicants allotted with a net maximum 30 unit shares each and 104,292 applicants a net minimum 20 unit shares each. 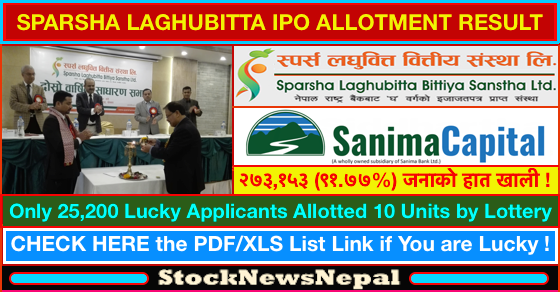 Sparsha Laghubitta IPO Allotment Result - Only 8.23% Applicants Allotted 10 Share Units ! 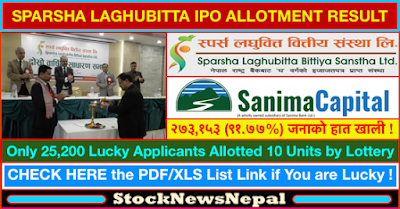 Sparsha Laghubitta Bittiya Sanstha Ltd. (SPARSHA) has successfully concluded its initial public offering (IPO) on Sunday morning at 10:00 AM today, 24th March 2019 (10th Chaitra 2075) in the premises of Sanima Capital Ltd., its issue manager. The microfinance company had floated 269,630 unit ordinary shares worth Rs 26.963 million (Rs 2.6963 crores) at a face value of Rs 100 each to the general public, for four working days, starting from Sunday 10th March 2019 (26th Falgun 2075) to Wednesday 13th March 2019 (29th Falgun 2075) two weeks ago. The issue had received 298,938 applications for 8,138,440 unit shares with an overwhelming 30.2 times oversubscription, of which 585 applications for 15,500 unit shares were invalid due to errors and of the remaining 298,353 valid applications for 8,122,940 unit shares, only 25,200 (8.45%) lucky ones were allotted 10 unit shares each by lottery on pro rata basis, thus leaving a larger of 273,153 (91.55%) applications empty handed. 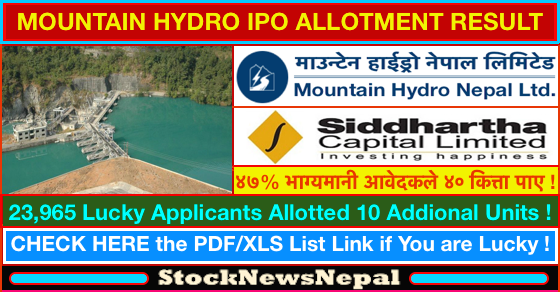 Mountain Hydro IPO Allotment Result - 47% Applicants Allotted Upto 40 Share Units ! Mountain Hydro Nepal Ltd. (MHNL) has successfully concluded its initial public offering (IPO) on Sunday morning at 10:00 AM today, 17th March 2019 (3rd Chaitra 2075) in the head office at Naxal, Kathmandu. The company had floated 1,816,110 unit shares (including 566, 110 unit shares unsubscribed by the locals) worth Rs 181.611 million (Rs 18.1611 lakhs) at a face value of Rs 100 each to the general public, for four working days, starting from Thursday 7th March 2019 (23rd Falgun 2075) to Tuesday 12th March 2019 (28th Falgun 2075) just over a week ago. According to Siddhartha Capital Ltd., its issue manager, the issue had received 50,954 applications for 3,394,810 unit shares with 1.92 times oversubscription, of which 16 applications for 1,540 unit shares were invalid due to errors and of the remaining 50,938 valid applicants, 26,973 applications (52.95%) were allotted 30 unit shares each and the other 9,58,600 applications were allotted 40 unit shares each on pro rata basis so that 23,965 (47.05%) of these applications have been lucky enough to be allotted with an additional 10 unit through the lottery system, thus leaving none empty handed. 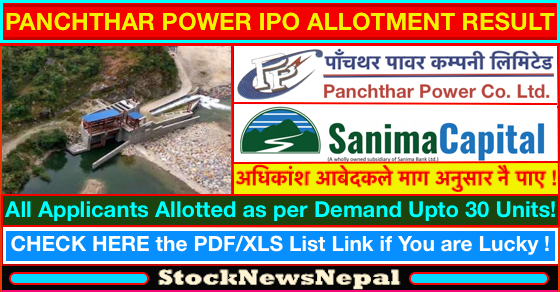 Panchthar Power IPO Allotment Result - All Allotted as per Demand upto 30 Unit Shares ! 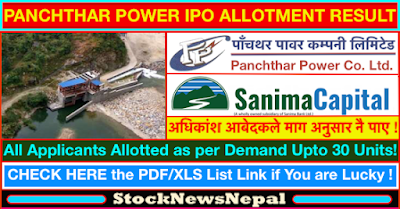 Panchthar Power Company Ltd. (PPCL) has successfully concluded its initial public offer (IPO) on Thursday afternoon 3:30 PM onwards today, 7th March 2019 (23rd Falgun 2075). The company had floated its IPO issue of 1,750,250 unit shares each at a face value of Rs 100 to the general public, for four working days, starting from Monday 25th February 2019 (13th Falgun 2075) to Thursday 1st March 2019 (17th Falgun 2075) just last week. According to Sanima Capital Ltd., its issue manager, there were 82,741 applications applying for a total of 3,381,860 unit shares with 1.93 oversubscription, of which 33,565 applying for 10 unit shares have each been allotted full as demand and 11,482 applying for 20 unit shares have also been allotted full as demand, but 37,627 applying for minimum 30 unit shares to maximum 9,620 unit shares have each been allotted 20 unit shares on pro rata basis and each 33,531 of these have been lucky enough to be allotted with an additional 10 unit shares of the remaining 335,310 unit shares through the lottery system, thus leaving none empty handed. The Master Swing Trader Toolkit: The Market Survival Guide ! With more than 50,000 copies sold, Alan Farley’s The Master Swing Trader has become the definitive guide for maximizing profit from short-term price moves. 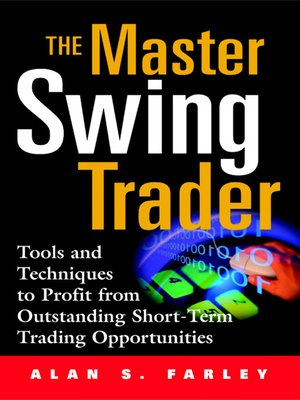 Now in his highly anticipated companion volume, The Master Swing Trader Toolkit: The Market Survival Guide, Farley builds on his proven strategies and techniques and delivers new tips for consistently beating the markets— today and in the future. Labels: Alan S. Farley, Book, Copy, Download, Link, Opportunities, Profit, Share, Short-Term, Stock, Techniques, The Master Swing Trader Toolkit: The Market Survival Guide! हेर्नुस्, चैतको अन्तिम सातासम्मका सबै अंकहरु ! 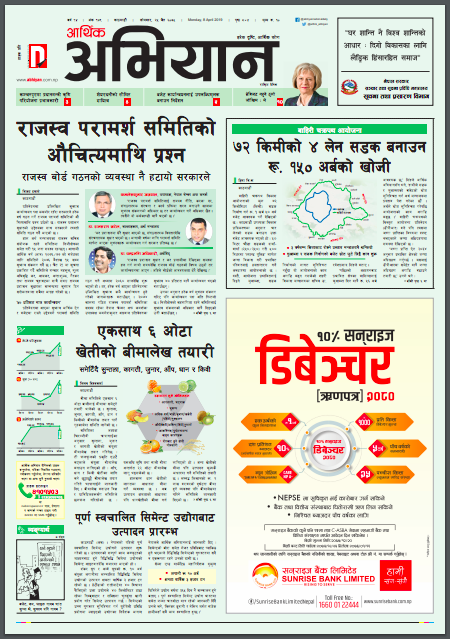 READ/DOWNLOAD NATIONAL DAILY E-NEWSPAPERS on NEPAL STOCKS HERE ! Start Download - View PDF ! CURRENT RIGHT SHARES ! CHECK ELIGIBILITY HERE !! Didn't Your Bonus Share Still Show up into Your Demat Account ? Have You Paid Taxes? How do You Know? Check Here for Details ! Radhi Bidyut Company Limited (RBCLL) IPO Result, Check if You're Lucky! Aarambha Microfinance IPO Allotment Result in Less than 2 Days, Check Yours Now ! Top Blue Chip Commercial Banks - Best Buy by Rating Wise Analysis ! Premier Insurance (PIC) FPO Result Out, Check Online if You're Lucky! How Much Worth Now of Rs 1 Lakh Investment in NTC, NABIL & CHCL Stocks 5 Years Ago ! Rasuwagadhi and Sanjen IPO Allotments Concluded Today Sunday Afternoon ! Gateway to Microfinance Companies Listed in NEPSE !